The painting job is done, done, done. The door trim is painted, the walls too. Now I’m told that I’ve got to recaulk the downstairs shower. We have a visitor coming and it needs to look beautiful. Methinks the jobs never end, and the boss [may her initials, K.S.W, be logged in the world-renown big book of job creators] keeps finding new ones. Wouldn’t-cha-know-it. OK, off to Home Depot for the necessary tools and supplies. Later…. Well the painting is done. The back door is replaced. I have a few minor things to finish on the back door. For example, the inside trim needs to be painted, the walls around the door need to be touched up, and finally the bottom edge and molding needs to be silcon sealed/caulked. But then that’s it. Oh my oh my, what shall I do? This enormous, multi-month long job is done. Nevertheless, it’s almost time to start my running class. That will fill my early Sunday mornings, ahhhh, beautiful Town Lake. Now that’s something to look forward to. I’m still watching Big Brother 5, and Amazing Race 5. I look forward to Tuesdays for them both, and Thursdays & Saturdays for Big Brother 5. I was wandering around the grocery store, and music was being played over the loudspeakers. What surprised me is that it’s rock and roll music. I think it was the Kinks. Stuff from my teens. You gotta understand how freaky this is. When I was teen the piped in music was from my parents generation, big band stuff or worse, and it was very bland. Now I’m sure that kids today are saying that the grocery store music is old, that is, it’s from their parent’s generation, but regardless it’s ROCK AND ROLL! This is something that our generations have in common, whereas, my parents and my generation do not. I was slow getting started today, but I kept with it all day long, and I’m now exhausted. With Matthew’s help I mounted the door, shimmed it level, inserted the security sensor, put on the outside trim, blew foam insulation in the cracks, remounted the knobs and strikeplates, painted the outside trim and frame, put on the inside molding, and reattached the blinds. Doesn’t it look nice. Now all I have to do is paint the inside molding, caulk/seal the inside floor edge, and mount a dead bolt strikeplate. With that the house painting will be done, totally done. I’m glad. Just in time to focus on my running course. 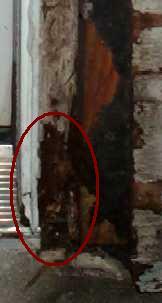 The outside wood trim at the bottom of the back door is rotten. I think it’s called dry root. When I push a screw driver into that area, it is like sticking a knife into warm butter. So I removed the trim, and when it was off I could see that the frame at the bottom on each side was rotten too. Ugh! I knew this wasn’t going to be easy. There was no way I could save the door. So I removed all the hardware, measured the door, and Matthew and I bought a new one at Lowes. Tomorrow the fun starts… removing the old door and installing a new one. 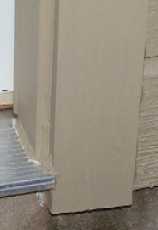 This includes adding new trim on the outside and new molding on the inside. Oh, one other thing, the house has a security system and there is a magnetic proximity sensor embedded in the door frame that must be reinstalled properly – that’ll be fun. Finally, once the door is removed I have to analyze why it rotted. I’ve got to understand where the water came from, and somehow get it to go somewhere else so it never happens again, at least not while I’m living here. Ever since I’ve been a young person I’ve wanted to do a few things. For example, I’ve wanted to play a bass guitar. Now that I’m a “mature” adult I’ve let go of this childhood dream. Somehow this one is no longer me. I’ve already talked about go-karts, and I did at one time own one. Now the question is whether or not I will ever own one again. Another thing is that I’ve always wanted to see the Grand Canyon, however, each chance I get to travel it’s not been at the top of my list. For example, I’d rather visit London or San Francisco than the North Rim. Finally I’ve wanted to create a cycloidal propulsion vehicle. This was based upon an article in Mechanical Engineering, April 1963, page 60-61. This one still interests me, but then again it was a childhood dream which maybe I’ve outgrown. But then why did I try to take a computer aided mechanical drafting course at the local community college, and I’m considered taking a welding course to help me make one of these. I feel I’m a terrible writer. Somehow the words just don’t flow. I think I think too much. I read my writing over and over again. I wish it would just be easier. However, I have found that when I listen to music, only music without words, I do better. I’ve found that Bach is best for me. I like lots of notes. Somehow this music does something to me mentally that I feel helps me write. Maybe the added audio stimulus keeps my minds busy in a way that allows my words to come out easier. Why is that? I’ve started a new weblog to journal my second marathon. See Watt’s Running and read about the pain as I train. You are currently browsing the Watt's Up blog archives for August, 2004.